You'll be £30.00 closer to your next £10.00 credit when you purchase Decorated Roman Armour. What's this? Order within the next 4 hours, 2 minutes to get your order processed the next working day! From the time of the Bronze Age, warriors of all tribes and nations sought to emblazon their arms and armour with items and images to impress upon the enemy the wealth and power of the wearer. Magnificently decorated shields were as much a defensive necessity as a symbol of social status. Equally, decorative symbols on shields and armour defined the collective ideals and the self-conceived importance of the village or city-state its warriors represented. Such items were therefore of great significance to the wearers, and the authors of this detailed and extensively researched book, have brought together years of research and the latest archaeological discoveries, to produce a work of undeniable importance. 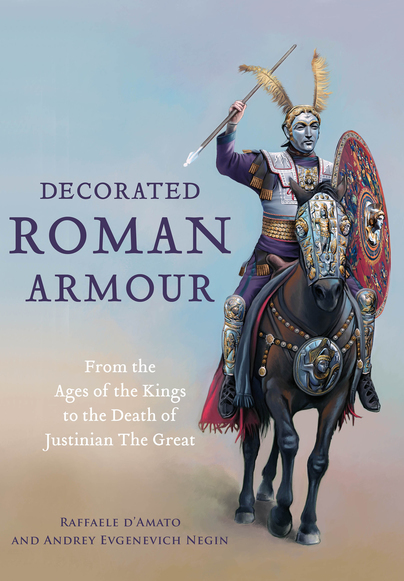 Decorated Roman Armour is richly illustrated throughout, and as well as battlefield armour, details the tournament and parade armour from Rome's earliest days. Impresionante, poco más puedo decir. Para los pintores de figuras que trabajen esta época es un libro documental esencial que debe figurar en su biblioteca personal. This is a great book just to have out for a conversation piece for people that just want to browse the pictures, but the narrative is just as enticing. Loved this! Raffaele D'Amato has written many articles on warfare and has a special interest in the military equipment of Ancient Rome and Byzantium. He devotes a great deal of his free time to historical and archaeological research, travelling extensively throughout northern Europe, Greece, Eygypt, Turkey and the Balkans, and works in collaboration with various institutes of history and archaeology. Dr Andrey Negin is candidate of historical sciences (Russian PhD), member of the department of history of the Ancient World and Classical Languages of Nizhny Novgorod State University named after N.I. Lobachevsky (Russian Federation). He has carried out fieldwork on ancient Roman armour and has published books and numerous articles on Roman military equipment.